This article is about boxes for depositing letters. For video framing, see letterbox. For the type of interprocess communication, see MailSlot. For the They Might Be Giants song, see Flood (They Might Be Giants album). Wall-mounted or attached mailboxes may also be used in place of mail slots, usually located close to the front door of the residence. They are known as "full-service" mailboxes when they have provisions for securing outgoing as well as incoming mail. Attached wall-mounted mailboxes are still used in older urban and suburban neighbourhoods in North America. They are especially common in urban and suburban areas of Canada, where the curbside mailbox is rarely seen except in rural areas. 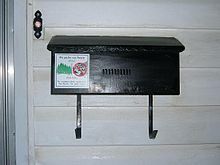 Attached mailboxes are less common in newer urban and suburban developments and in rural areas of the United States, where curbside delivery or delivery to a community mail station (cluster mailbox, known as a bank of post boxes in the UK) is generally used. Rural and some suburban areas of North America may utilize curbside mailboxes, also known as rural mailboxes. These receptacles generally consist of a large metal box mounted on a support designed primarily to receive large quantities of incoming mail, often with an attached flag to signal the presence of outgoing mail to the mail carrier. 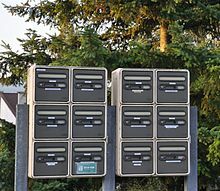 In the US and Canada, rural curbside mailboxes may be found grouped together at property boundaries or road/driveway intersections, depending upon conditions. Although the United States Postal Service (USPS) has general regulations stating the distance a letter box may be from the road surface, these requirements may be changed by the local postmaster according to local environment and road conditions. In the US, wall-mounted or curbside mailboxes that are only designed for receiving incoming mail are known as "limited-service" mailboxes, while mailboxes equipped with a mechanism for notifying the postman to collect outgoing mail from the mailbox are known as "full service" mailboxes. 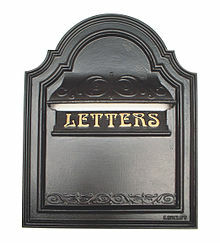 A number of designs of letterboxes and mailboxes have been patented, particularly in the United States. One design was the visible mailbox (because it was made of transparent glass) with a flip-up aluminium lid produced during the first part of the 20th century by George F. Collins of the Barlet-Collins Glass Company in Sapulpa, Oklahoma. When positioned externally, the post box should not allow more than 1% total capacity water ingress from natural precipitation or moisture causes. This Standard is voluntary. It was developed by a German mail boxes manufacturer Burg Wächter and it reflects this manufacturer's technical capability and commercial interests with a number of the specifications unfounded, for example, aperture dimensions or internal volume, while the vital issues of security, energy saving, and environmental issues of a property and the occupants are not addressed in the Standard. Although the Standard was due for a review after 5 years in 2007, this did not happen. In April 2013 the amended Standard BS EN 13724:2013 was finally published, however, again it was drafted by the same company and is nearly word-for-word copy of the old EN 13724:2002 Standard. The essential amendments (especially important for the UK) were not included again and the interests of security, energy saving and wellbeing of the public were not addressed. For those neighbourhoods where mail delivery to a mail slot is still provided, mail slots must have an opening not less than 17.5 cm by 4 cm, and must be located in a front door or adjacent panel not more than 125 cm and not less than 60 cm from the finished floor line. Wall-mounted mailboxes equipped with a slot must have a slot opening measurement not less than 13.5 cm by 4 cm and the slot located on or near the top of the box. Curbside mailboxes, known in Canada as rural mailboxes, must be weatherproof, have space for the name of the mailbox owner, and possess a signal device on the right-hand side (when facing the front of the mailbox) for pickup of outgoing mail. The signal device must rise above the mailbox and be visible at a distance, and must not obscure the mailbox owner's name or impede vehicular or pedestrian traffic. Canada Post requires all rural mailboxes to have a minimum interior dimensions of 45 cm in length by 17.5 cm in width by 17.5 cm in height for a rectangular mailbox, and 45 cm in length by 25 cm in diameter in the case of a cylindrical mailbox. The US Post Office has established guidelines for mail recipients, including mail slot or mailbox size, location, and identification requirements. While the Post Office permitted alternative designs for attached mailboxes and mail slots that met basic size and construction requirements, the same was not true for curbside mailboxes, which postal regulations required be in the form of the traditional dome-rectangular or 'tunnel-top' design first established in 1915. In 1978, seven years after the establishment of the restructured US Postal Service, postal authorities at last approved a "contemporary" mailbox specification for alternative designs. Currently, US curbside mailboxes are classified as (T) Traditional, (C) Contemporary, or (L) Locking. Traditional or Contemporary non-locking curbside mailboxes are approved in three sizes - No. 1, No. 2, or No. 3, measured by minimum interior dimensions. The largest acceptable curbside mailbox is the No. 3, which measures 22.81 inches long, 11 inches wide, and 15 inches in height (58 cm x 28 cm x 38 cm) at the peak. Locking mailbox designs that provide security for the recipient's incoming mail have fewer restrictions on shape and size, though designs with a slot for incoming mail must be at least 1.75 inches high by 10 inches wide. Residential locking mailboxes cannot require the postal carrier to have a key, by USPS Specifications. Therefore, no USPS approved residential locking mailbox has secure outgoing mail. Installation requirements vary from standard unlocked mailboxes: with locking mailboxes, the incoming mail slot must be 41"-45" above the roadside surface, and the front of the mailbox must be 6"-8" back from the curb. USPS specifications for all mailboxes mandate the same, except the placement of the 'incoming mail area' varies with a locking mailbox. Private letterboxes or mail slots did not become popular in most of Europe until the mid to late 19th century, although they were used in Paris from the late 18th century. In 1849, the Royal Mail first encouraged people to install letterboxes to facilitate the delivery of mail. Before then, letterboxes of a similar design had been installed in the doors and walls of post offices for people to drop off outgoing mail. An example of such a wall box (originally installed in the wall of the Wakefield Post Office) is dated 1809 and believed to be the oldest example in Britain. It is now on display at the new Wakefield Museum. In 1863, with the creation of Free City Delivery, the US Post Office Department began delivering mail to home addresses. 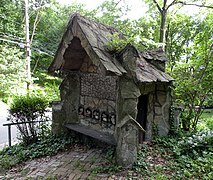 As early as the 1880s, the Post Office had begun to encourage homeowners to attach wall-mounted mailboxes to the outside of their houses in lieu of mail slots. Mounted at the height of a standing man, attached mailboxes did not require the mail carrier to lean over to deposit the mail. They also allowed the homeowner to keep outgoing mail dry while awaiting pickup by the mail carrier. To reduce the time required for the mail carrier to complete delivery when the front door of a home was located some distance from the street, it was proposed that individual mail boxes for residential or business customers be mounted curbside on fence-posts, lamp-posts, or other supports. While this idea was rejected for city mail delivery, it was adopted for rural areas. Curbside mailboxes located on a rural route or road and sited at the intersection of the road with each recipient's carriageway or private drive allowed limited numbers of mail carriers to deliver mail to many widely scattered farms and ranches in a single day using horse-drawn wagons or later on, motor vehicles. Before the introduction of rural free delivery (RFD) by the Post Office in 1896, and in Canada in 1908, many rural residents had no access to the mail unless they collected it at a post office located many miles from their homes or hired a private express company to deliver it. For this reason, mailboxes did not become popular in rural North America until curbside RFD mail delivery by the Post Office was an established service. Even then, farmers and rural homeowners at first resisted the purchase of dedicated mailboxes, preferring to leave empty bushel baskets, tin boxes, or wooden crates at the roadside for the postman to deposit their mail. Not until 1923 did the Post Office finally mandate that every household install a mailbox or mail slot in order to receive home delivery of mail. Originally designed only for incoming mail delivery, curbside mailboxes were soon fitted with a semaphore or signal flag mounted on an attached arm to signal the postman to pickup outgoing mail. Originally, this flag was raised not only by the resident of the property to signal the postman of outgoing mail, but also by the postman to inform the recipient that incoming mail had been delivered - a convenience to all during periods of freezing or inclement weather. 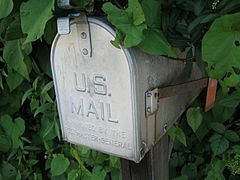 Since 1923, in order to promote uniformity, as well as the convenient and rapid delivery of the mail, the United States Post Office Department (later the USPS) has continued to retain authority to approve the size and other characteristics of all mail receptacles, whether mailboxes or mail slots, for use in delivery of the mails. The USPS continues to issue specifications for curbside mailbox construction for use by manufacturers. Approved mailboxes from the latter are always stamped "U.S. Mail" and "Approved by the Postmaster General". These standards have resulted in limitations on product diversity and design, though new materials, shapes, and features have appeared in recent years. After World War II, postwar suburban home construction expanded dramatically in the United States, along with mail volume. By the 1960s, many new suburban homes were considerably larger and located on larger lots, yet most still used mail slots or attached wall-mounted mailboxes. This development caused a substantial increase in distances walked by the mail carrier, slowing mail delivery while increasing labor costs. In order to reduce delivery times and increase efficiency, the Post Office began requiring all new suburban developments to install curbside mailboxes in place of door-to-door delivery, allowing mail carriers to remain in the vehicle while delivering the mail. In 1978, the USPS (successor to the Post Office) declared that every new development must have either curbside delivery or centralized mail delivery. In 1915, the familiar curbside Jorolemon mailbox, named after its designer, Post Office employee Roy J. Jorolemon, was approved by the Post Office. Jorolemon, who held a degree in mechanical engineering, designed his mailbox with an unusual dome-rectangular shape, incorporating a curved, tunnel-shaped roof, latching door, and rotating semaphore flag. The Joroleman mailbox has been praised as a manifestation of American functionalist industrial design. Constructed of light-gauge painted sheet steel, Jorolemon designed his mailbox with an arched, tunnel-shape roof, which prevented excessive accumulation of rainwater or snow while resisting deformation. The tunnel top also simplified the process of mass production by eliminating the need for precise sheet metal bends. Stamped and formed metal straps riveted to the arched opening and the mailbox door served as a door latching mechanism, while a rotating red semaphore flag mounted on a shaft attached to the side of the mailbox served to signal the approaching mailman if there was outgoing mail inside. Fitted with a crimped or braze-on rear steel panel and a false floor to keep its contents dry in inclement or humid weather, the Jorolemon mailbox required only two rivets, three axle bolts, and four screws and nuts for completion. Durable and inexpensive, the popularity of the Jorolemon mailbox was further enhanced by a decision not to patent the design, but to make its specifications known to all potential manufacturers for competitive sale. 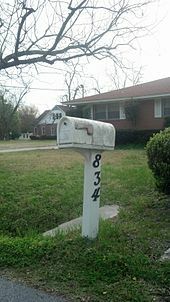 Adopted across the United States, it has remained the top-selling mailbox since its introduction, and was also widely used in Canada prior to that country's decision to eliminate individual curbside delivery to rural residents. The Jorolemon mailbox was originally approved for manufacture in one size, the No. 1, which could accommodate letter mail, periodicals, newspapers, catalogs, and small parcels. After July 1, 1916, the Jorolemon mailbox would be the only design approved by the Post Office for new curbside mailbox installations. In July 1929, the Post Office approved specifications for a larger Jorolemon mailbox known as the No. 2. The No. 2 mailbox, soon followed by the still-larger No. 3, could accept larger parcels and packages sent via Parcel Post; these large boxes proved particularly popular with rural mail recipients, who could order manufactured goods by mail for delivery to the farm or ranch. Jorolemon curbside mailbox with red semaphore flag. When raised, the flag indicates outgoing mail. On the Galápagos Islands, Ecuador, a post barrel on the island Floreana has been in use for a number of years, for both incoming and outgoing mail. The island is remote; mail delivery is erratic and can be very slow. KopparStaden AB, a housing cooperative in Falun, Sweden, has begun to install centralized mail stations with individual letterboxes using electronically operated doors in its buildings. Many designs of mailboxes have been created during recent years with products suitable for both multi-occupancy residences (typically tower block private accommodation properties) and individual homes. Deliveries of mail are typically made in to the mailbox through an aperture opening (an entry hole in the mailbox), where it drops into a secured compartment. The deposited items can only be retrieved an individual using a coded key (designed to work only with that particular coded lock), or by entering a number sequence via a combination lock. Electronic locks can also be used with mailboxes but they must be used in an internal location due to their vulnerability to inclement weather in the United Kingdom. Mailboxes are commonly manufactured using Zintec Steel, Aluminium, Stainless Steel or Galvanised Steel, and then powder coated to meet the design requirements of the mail recipient. 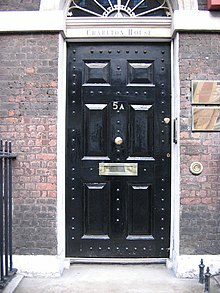 Mailboxes can also be manufactured using materials including Cast Iron and Plastic, but these are less commonly seen in the United Kingdom. Mailboxes all come with an aperture opening, which allows for the potential of vandalism or theft of deposited mail, but additional items are available to help reduce this including aperture restrictors, which allow for the recipient to adjust the opening on their mailboxes and set it as they see fit. 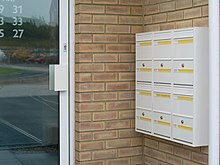 In multi-occupancy developments, mailboxes are commonly ‘banked’ into a collection of mailboxes, allowing for delivery personnel to deposited items in a single location, rather than having to travel to each individual door to deliver mail. These banks of mailboxes are often used in new construction developments in place of letter openings in the property doors. A bank of wall mounted post boxes used outside of a property entrance door in the United Kingdom. Numerous designs of mailboxes with improved construction and security have been patented in recent years, particularly in the United States. In 2001, the USPS first approved designs for locking curbside mailboxes to stem a rise in identity and mail theft. With these secure designs, the incoming mail is placed into a slot or hopper by the mail carrier, where it drops into a secure locked compartment for retrieval by only the homeowner (who retains a key or combination to the lock). Locking mailboxes are generally constructed of heavy-gauge steel or aluminum plate, though some models are made of roto-moulded polymer plastic. Because of the increased risk of vandalism to curbside mailboxes, numerous vandal-resistant boxes made of composite plastic or heavy-gauge steel or aluminum plate have also entered the market. Some composite mailboxes made of resilient polymer plastics and mounted on ground spikes can resist severe impacts from baseball bats or even being run over by a vehicle. In 1978, steady increases in postal service costs caused the USPS to insist on either curbside or centralized mail delivery for new suburban neighborhoods and developments. A 1995 cost delivery study published in a USPS Operations handbook listed per-address annual delivery costs as: Door-to-door, $243; Curbside, $154; Cluster Box (centralized mail delivery), $106. Large apartment buildings usually have a cluster of mailboxes for all units, located in the entry lobby or in a nearby dedicated mailroom. There often is a special lock box (also called a "key keeper" or "Knox box") located at the outside entrance, which either gives access to a front door key or directly activates the front door electric strike, to allow the mail delivery person to enter the building. 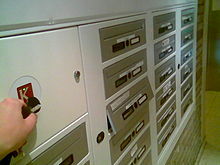 A similar "Arrow lock" is usually located on the centralized mailbox, to allow the entire unit to be opened for efficient filling of individual mailboxes. 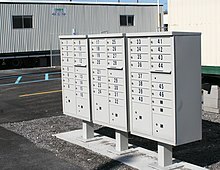 In the US, a property with a single mailing address but with multiple mail recipients may utilize a community mail station designated CBU, or Cluster Box Unit. CBUs are typically stand-alone units that have locked individual compartments for each tenant in an apartment building, a trailer or mobile home park, or an office center. By policy, the USPS is reluctant to establish direct to door delivery to new addresses, and now requires special approvals to initiate this service (Postal Operations Manual, Section 631.2) Instead, the USPS has insisted upon centralized mail delivery in virtually all newly constructed residential housing developments, condominiums, and gated communities by requiring or incentivizing the builder or developer to install larger NDCBU (Neighborhood Delivery Collection Box Unit) stations. CBUs and NDCBUs are both commonly known as cluster mailboxes. The NDCBU is a centralized community mail station with compartments for the centralized delivery of mail to multiple recipients at multiple addresses within a single neighborhood development or community. In new housing developments, the NDCBU location is fixed by the developer, not the USPS, and may be located hundreds of yards away from the addressee's actual residence. A parcel locker for receipt of packages and a separate compartment for outgoing mail are usually built into the station. The mail carrier will have a key to a large door on one side that reaches all the compartments, and the residents or tenants will each have a key to the door into their individual compartment on the other side. The location of the NDCBU in a community or business center is extremely important, since neighborhood cluster box installations located in remote or poorly lighted areas invite large-scale mail theft or vandalism. Even when located in a high-traffic location or inside a gated community, the NDCBU is a tempting target for thieves attracted by the possibility of recovering checks, cash, identifying information, or other valuables from multiple victims. A 2008 RAND Corporation study, citing USPS statistics collected between 2004 and 2007, found that NDCBU thefts constituted 52.7% of all urban neighborhood mail thefts and 76.6% of all rural neighborhood mail thefts from locations with more than one mailbox, with higher-income ZIP code zones having a substantially higher number of thefts than low-income ZIP code zones. In Canada, community mailboxes (or Supermailboxes) appeared in the late 1980s in newer suburban areas. Newer developments usually are temporarily supplied with green rural community mail boxes and replaced later with permanent supermailboxes. Home Parcel boxes are being used in Australia to facilitate the delivery of parcels ordered over the internet as the letter box declines in use due to emails. Special locking mechanisms with dynamic codes are being used to create a new lock code on every delivery, ensuring greater security from petty theft. These lock codes are accessed by the delivery company using their barcode scanner and a standard barcode or QR code. The largest mailbox in the world is located in Casey, Illinois (US) and measures at 162.63 cubic metres (5,743 cu ft). It was created by Jim Bolin and was verified on the 20th of October 2015. ^ "US Postal Customer guidelines". Pe.usps.gov. Archived from the original on 2012-10-04. Retrieved 2012-09-19. ^ "Mailbox FAQ". MailBoss.com. Epoch Design. Retrieved 14 June 2013. ^ "USPS Specs". MailBoss.com. Epoch Design. Retrieved 14 June 2013. ^ "Mailbox Guidelines". USPS.com. USPS. Retrieved 14 June 2013. ^ Black, J. C.; Layoff, T. "Summer of 1995 – Mailbox Temperature Excurions of St Louis" (PDF). US FDA Division of Drug Analysis. Retrieved 12 July 2011. ^ "Tips for Postal Customers with Centralized Mailboxes". about.usps.com. United States Postal Service. Retrieved 2017-03-31. ^ a b c d e f g h i Bruns, James H. (July–September 1996). "Soap boxes won't do". EnRoute. National Postal Museum. Archived from the original on 2003-05-28. Retrieved 2014-09-23. ^ "Blue Mound, Missouri Postal History". Bluemoundhistory.com. Retrieved 2012-09-19. ^ Pappas, Max. "Cluster Boxes, Not Door-to-Door Delivery". Providence, Rhode Island Journal. Archived from the original on October 22, 2008. ^ "Costly Mailbox Rules Take Effect in September". Nations Building News. Archived from the original on 2008-07-05. ^ City of Ventura, California, Home & Neighborhood Safety: Cluster Mailboxes Archived 2012-02-02 at the Wayback Machine, retrieved 23 January 2012: "Cluster mailboxes are those that house mail receptacles for several residences...They make particularly attractive targets for thieves, as once the back of the box is breached, all of the individual sections become accessible and mail from many households can be taken in a very short period of time." ^ "Cluster Boxes Replacing Door-to-Door Delivery". Nations Building News. Archived from the original on 2008-10-10. 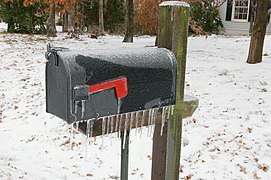 ^ "Rural Community Mailboxes Unsafe, Say Residents". CBC News. December 7, 2007. Archived from the original on February 27, 2009. ^ "Largest mailbox". Guinness World Records. Retrieved 2016-12-14. 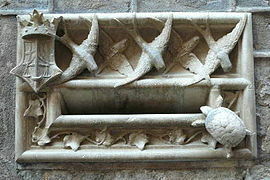 Wikimedia Commons has media related to Mailboxes.